Mr. DeSimone began his professional career in the financial industry. After nearly 10 years in finance, he decided to further his education by attending law school. He earned his law degree from Seton Hall University School of Law, and, after his approval to practice law in New Jersey, he went to work for a large law firm where he gained experience solving complex legal problems that continues to serve his clients so well today. 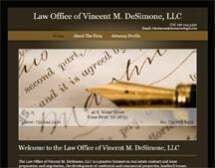 If you face a legal challenge and you want an attorney who will provide services tailored to fit your needs, look no further than the Law Office of Vincent M. DeSimone, LLC. As a sole practitioner, Mr. DeSimone provides personalized service to every client, which guarantees that he will work not only to help you overcome your challenge but also to help you reach your goals.